The Traffic Commission receives proposed ordinances from the City Council, conducts traffic studies, and makes recommendations based on its findings. 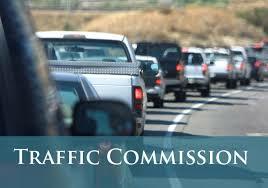 The ordinances cover motor vehicles and all forms of traffic within the City. Examples of the topics included are handicapped parking requests, prohibited parking, fire lanes, and loading zones. The Commission has 5 members, each serving 3-year terms.